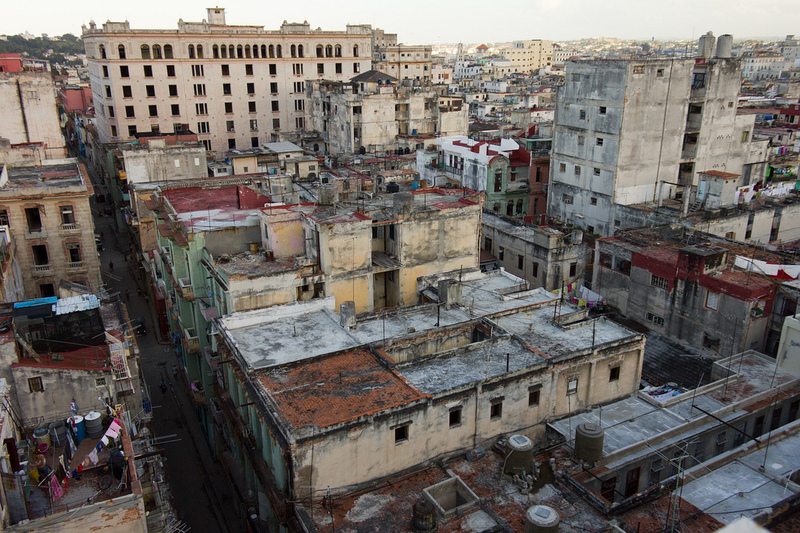 David Mackenzie, Flickr/lyrislite, view of city rooftops, Havana, Cuba. The Southern California Institute of Architecture (SCI-Arc) presents Havana/L.A./Havana, a major public symposium exploring contemporary architecture in Cuba, envisioning possibilities for the future of Havana's built environment, and encouraging a renewed cultural and artistic exchange between Cuba and the United States. This public program presents the new generation of Cuban architects shaping the future of Havana's urban landscape. In conversation with their peers in Los Angeles and architectural scholars, historians, and critics, the symposium presents the work and influences of the current generation of architects living and working in Havana; envisions possibilities for the future of Havana's built environment; and encourages a renewed cultural and artistic exchange between Cuba and the United States. Hernan Diaz Alonso, graduate program chair and incoming director of SCI-Arc, is principal and founder of the Los Angeles-based design practice Xefirotarch. Considered one of the most influential voices of his generation, Diaz Alonso has served for the past several years as distinguished professor of architecture at SCI-Arc. Diaz Alonso has lectured extensively around the world, and his work has been the subject of solo shows at San Francisco MoMa; the Art Institute of Chicago; MAK Centre, Vienna; and the Pompidou Center. With close ties to the Latin American world, he will serve as the moderator of this program. Holly Block is the director of The Bronx Museum of the Arts, where she curated the exhibition Beyond the Supersquare, exploring the influence of Latin American and Caribbean modernist architecture on contemporary art. Before joining the museum, Block served as executive director of art in general, and also served as a co-commissioner for the Department of State for the 2003 Cairo Biennial. Block wrote Art Cuba: The New Generation, a comprehensive survey on contemporary art from Cuba. Ramiro Diaz-Granados is a Los Angeles architect who has worked as a project designer for the firms Gnuform and Arxis. He is in the midst of launching a new practice—Amorphis—that pursues an overt interest in materiality, visuality, and sensuality towards the production of the contemporary sublime. Diaz-Granados holds degrees from SCI-Arc and UCLA's Departmet of Architecture and Urban Design and is currently on faculty at SCI-Arc as a design, visual studies, and applied studies instructor. Belmont Freeman is the founding principal of Freeman & Pizer Architects and adjunct associate professor at Columbia University's Graduate School of Architectural Planning and Preservation where he teaches a design studio within the historic preservation program. An American of Cuban descent, Freeman is regarded as an expert on Cuban architecture. In 2004, he coproduced the landmark exhibition Architecture and Revolution in Cuba, 1959-1969 at Storefront for Art and Architecture. He lectures widely on his work and other areas of architectural and historical research. Universo Garcia Lorenzo is a Cuban architect whose work is dedicated to architectural design for social work and tourism. He is an assistant professor in the Department of Design at Polytechnic José Antonio Echeverría in Havana, Cuba. Marcelyn Gow is a partner and founding member of servo los angeles. Gow received her architecture degrees from the Architectural Association, Columbia University, and the ETH Zurich. Her doctoral dissertation, Invisible Environment: Art, Architecture and a Systems Aesthetic explores the relationship between aesthetic research and technological innovation. She currently teaches graduate design studios and cultural studies seminars at SCI-Arc and has been a visiting professor at the Royal Institute of Technology in Stockholm. Eduardo Luis Rodriguez is a Cuban architect, architectural historian, editor, and curator. He is the author of The Havana Guide: Modern Architecture 1925‐1965 and Theory and Practice of Modern Regionalism in Cuba. Rodríguez has been a scholar and lecturer worldwide and has served as curator of several major architectural exhibitions, including Architecture and Revolution in Cuba, 1959‐1969 at the Storefront for Art and Architecture. He has been the recipient of fellowships from the John Carter Brown, the John Simon Guggenheim Memorial Foundation, the David Rockefeller Center for Latin American Studies, Harvard University, and the National Institute of Art History. Dwayne Oyler, a Los Angeles-based architect, established Oyler Wu Collaborative with Jenny Wu in 2000. He has also worked in the office of Toshiko Mori, and has collaborated with Lebbeus Woods on several projects. Oyler received a BArch from Kansas State University in 1996 and an MArch from Harvard University's Graduate School of Design in 2001. He was awarded the Skidmore, Owings, and Merrill Traveling Fellowship in 1996. He teaches design studio and is the undergraduate thesis coordinator at SCI-Arc. Florencia Pita is a Los Angeles architect with the firm fpmod. Previously, she worked with Greg Lynn FORM, Peter Eisenman, and at Asymptote in New York. She graduated in architecture from the National University of Rosario, School of Architecture in 1998. In 1999, she was awarded the Fulbright-Fondo Nacional de las Artes scholarship to pursue studies at Columbia University, where she received her MSAAD in 2001. She currently teaches design studios and visual studies seminars at SCI-Arc. Claudio Vekstein is an Argentinian architect and principal of the award-winning studio eCV_Opera Publica, a firm specializing in the architecture of public works and urban infrastructure, in Buenos Aires Argentina. He has worked on numerous projects throughout Latin America, including in Venezuela, Paraguay, and Cuba. He is also a professor in the master's of architecture program at Arizona State University, where his teaching and research is focused on the relationship between architecture, public work, and the public interest. SCI-Arc director Eric Owen Moss is principal and lead designer of Eric Owen Moss Architects, founded in 1973. The firm has garnered over one hundred local, national, and international design awards and over a dozen monographs on Eric Owen Moss Architects have been published. Moss was honored with the Academy Award in Architecture from the American Academy of Arts and Letters in 1999. He received the AIA/LA Gold Medal in 2001. He is a fellow of the American Institute of Architecture and a recipient of the Distinguished Alumni Award from the University of California, Berkeley, in 2003. In 2011, he was awarded the Jencks Award by the Royal Institute of British Architects (RIBA) and last year received the Twenty-Five-Year Award for the Petal House from the AIA/LA. Moss was one of the selected participants of El Proyecto Habana: Arquitectura Otra Vez, an architecture conference in Havana in the mid-1990s. Hsinming Fung, SCI-Arc director of academic affairs, is principal and director of design for the internationally renowned architecture firm Hodgetts + Fung (H+F). Awarded an AIA Gold Medal Award in 2006, Fung also served as presidential appointee to the National Endowment for the Arts Council in 2001. In 1994, Fung and Craig Hodgetts were honorees of the American Academy of Arts and Letters, and Fung was a 1991 recipient of the National Endowment for the Arts Rome Prize Advance Fellowship. Most recently, Fung was appointed the 2013 President-Elect of the Association of Collegiate Schools of Architecture (ACSA), a non-profit, membership organization. Andrew Zago, coordinator of SCI-Arc's Visual Studies Program, is principal of Zago Architecture. He has over twenty-five years of professional experience in architecture, urbanism, and education. Zago is currently also a clinical professor at the School of Architecture, University of Illinois at Chicago, and has taught at Cornell University, the University of Michigan, the Ohio State University, and UCLA. He has lectured widely and his work has been exhibited both nationally and internationally. Zago is a fellow of the American Academy in Rome and a recipient of both an Academy Award in Architecture from the American Academy of Arts and Letters and a fellowship grant from United States Artists.